Over the last several years, there have been a lot of opportunities for me to order pizzas in Grand Rapids. I work a lot of nights and weekends so it’s not always easy to find something quick to eat. Pizza is my go-to and I eat way more of it than I should. A few years ago, I was told about Nantucket Baking Company. They had delicious, gourmet pizzas that were fairly cheap. I ordered from there quite a bit as it was pretty close to where I work. Sometime last year, the people that own Martha’s Vineyard, as well as Nantucket Baking Company, did some major remodeling. 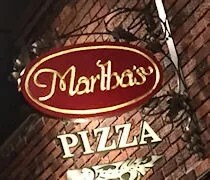 They opened a cafe on Lyon Street, moved Nantucket next to that, opened up Martha’s Vineyard into the old bakery and created Martha’s Pizza. 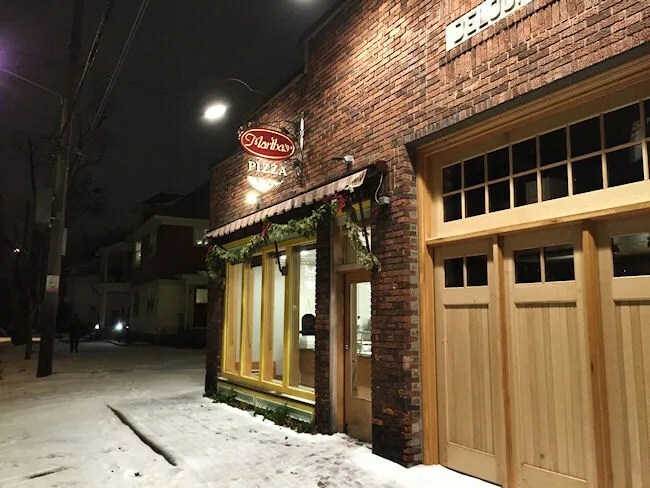 Martha’s Pizza is in the same spot and uses the same equipment that Nantucket Baking Company did on Union Street NE just north of Lyon. The difference now is the shop ONLY does pizza whereas they used to be a full on bakery. That operation has moved to the new building on Lyon Street. Martha’s Pizza is connected to Martha’s Vineyard, but it has it’s own entrance on the north end of the Union Street facade. From that perspective, not much has changed. It has the same glass counter with slices available and the same small waiting area. I had called in my order for a pizza with prosciutto, basil, and Gorgonzola cheese. The pizzas only come in 12″ sizes on a very thin and very crispy crust. I was told it would take about 40 minutes for my pizza to be ready. That seems pretty typical for them. I’ve never had less than a 30 minute wait so 40 didn’t seem that odd to me. They’re always really busy whenever I stop in. I had to pick a few things up from Martha’s Vineyard first, so by the time I made my way in to the pizza shop, my pizza was just coming out of the oven. It was transferred straight in to the box then sliced up. The cost was just a little over $12 which I put on my card then headed back to work to eat. 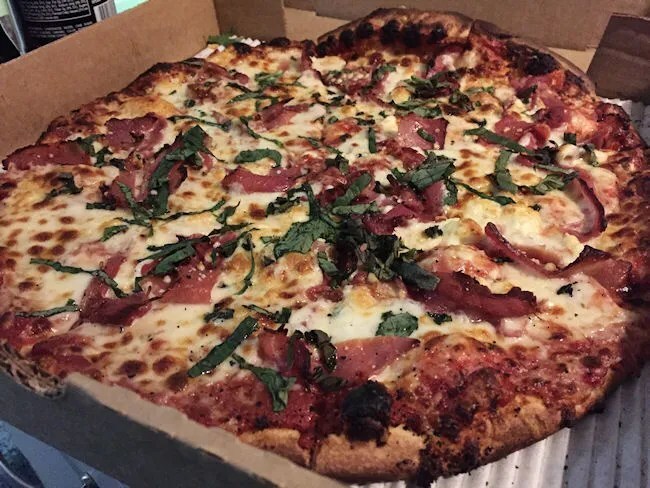 The pizza from Martha’s is…well…pretty amazing. 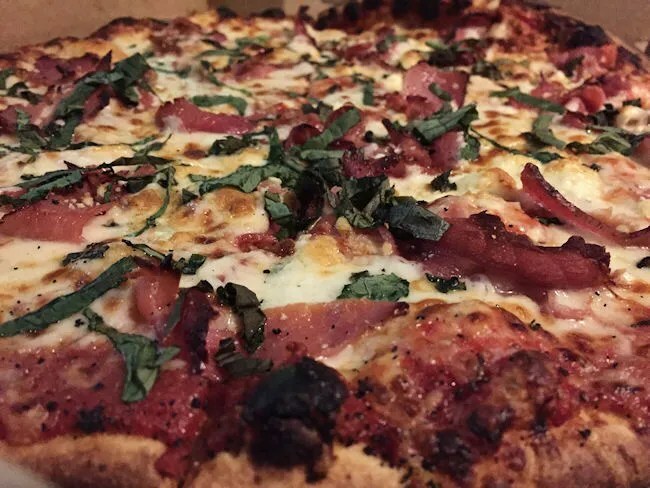 It’s everything you want in a gourmet pizza. Fresh ingredients that compliment each other and aren’t overwhelmed by a super thick, doughy crust. The crispy thin crust is so perfect on this pizza. It’s more than just a delivery vehicle for the toppings though. It has a thin layer of corn meal on the bottom that adds to the crunch and it snaps with every bite. It would be harder for me to find a pizza of this style that is anymore perfect than the one from Martha’s. I’ve always been such a huge fan of Martha’s/Nantucket’s pizza that it should come as no surprise that, five years later, I still really love it. The new name is really just that. A new name. The pizza is the same deliciousness they’ve been serving up for many years.